Louise Penny is Canadian crime writing royalty, who has delighted fans around the globe the past decade plus with her outstanding series starring Quebec policeman Armand Gamache. Since entering the CWA Debut Dagger competition for unpublished crime writers back in the early 2000s with the book that would become her debut Still Life, Penny has not only broken through to publication, but racked up several mantelpieces full of awards, topped the New York Times bestseller list, and seen her creation come to life in a Canadian television adaptation. She's a beacon for budding crime writers everywhere. At Bouchercon last month, Penny swept the major crime writing awards (Shamus, Macavity and Agatha) given out that weekend, for the 12th book in her Gamache series, A Great Reckoning. Over the past few months, Gamache has been having thoughts about radical ways to deal with the influx of crime in Quebec, particularly the unceasing flow of dangerous drugs that floods through the historic trading and smuggling routes prevalent throughout Quebec and downriver into the States. Meanwhile a sinister cloaked figure appears in the sleepy village of Three Pines, where Gamache lives. It stands silently on the village green, ominous yet unmoving. Is it a messenger, a symbol? Tensions rise, emotions fracture among the villagers, who want Gamache to do something. Then somebody is killed. Just what is going on in? Who brought the cloaked figure to town, and why? 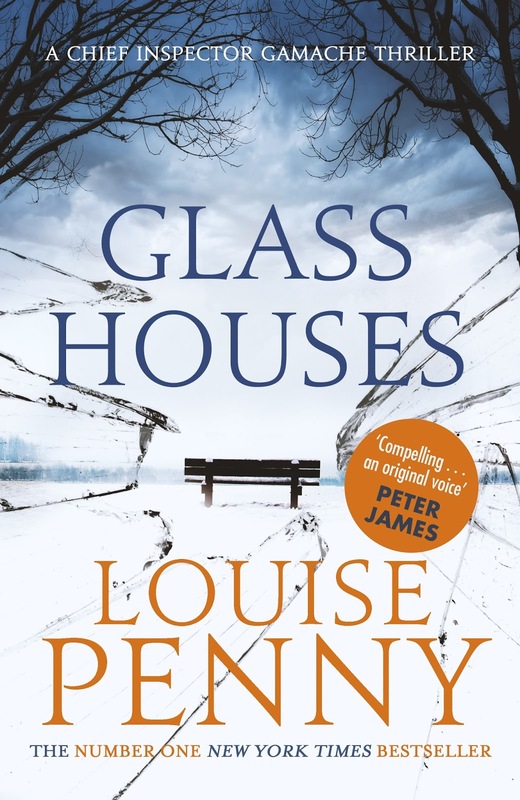 Penny delivers a delicious tale that blends the classic village murder mystery with a very modern tale threaded strongly with broader philosophical, psychological and social issues. Glass Houses is pleasantly quaint in tone at times, when it comes to the unique characters and interlocking relationships within the small village of Three Pines, but then also deals with some very dark issues: drug smuggling, violent crime, giant cross-border criminal enterprises operating with impunity. Can Gamache do anything to stop the seemingly endless flow of drugs into and through Quebec, or is he leading an outpost that's fully surrounded and just waiting to be overrun? With his entire province under pressure, can he even solve a murder in his own hometown, or is that beyond him now? Glass Houses is a great read, that flows along smoothly and offers lots to engage readers on multiple levels. Longtime readers can enjoy the way Gamache's role has developed over the series, and the escalating challenges he faces, while those new to the series might quickly become hooked and - like me - be searching out Penny's backlist to read more and more of Inspector Gamache and his peers.